Bathing Guinea Pigs isn't necessary in most cases. Bathing is very stressful and have to be done only if your cavy runs in trouble. [Auto translated] Bathe Guinea Pigs for grooming reasons is not quite elegant. They hate water- and in most cases they don’t need it on their fur also! If there is no particular reason just don’t to it. Additionally bathing Guinea Pigs abets some serious diseases. But for some reasons you have to bath your cavy. 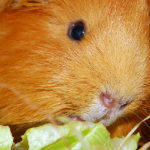 Lets have a look when it is necessary – and how do you do it with less stress for your Guinea Pig. Never ever bath a cavy because of your opinion your Guinea Pig might smell a bit too much or it is so cute bathing them. There are some horrible pictures out there of bathing cavys and some horrible how-tos too! Bathing a cavy must not be done due to some cosmetically reason or just for fun. A buck could smell quite nasty. Note that castration may not solve the problem and bathing is also the wrong way. Cleaning their bursa perinealis and glandula caudalis is always the better and stress-less option for your cavy. In fact Guinea Pigs are non swimmers. Whow! Their fur and skin is not made to water it and much less than this to shampooing it. Face this! They got their own oil and do never need baby shampoo or baby oil. Face this too please! A bath changes the structure of – and dry its skin. 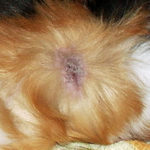 As a result it is much more susceptible for parasites like biting lice or mites. The regeneration of the small layer of fat / oil on the skin who prevents may take weeks. Also bathing is very stressful for your cavy which favored the population of parasites too. So there are really not many good reasons to bath your cavy. If your Guinea Pig is fit and happy you must not bath it, especially not if you just like it or you might think it smells. First of all: Always balance the pros and cons before you bath it and only do it if the pros are outweigh – like some serious parasitic infection which could require it. Bathing might be useful if the fur is highly felted. This could happen if you or the previous owner neglect it. Bathing is useful to clean out dead parasites if your cavy has a parasitic infection. As a result of bladder infection the rump could be wet and you should clean it. Only bath the rump! Also diarrhea could make its rump get filthy and contaminated. And also bath the rump only. If your cavy is serious sick an could not move itself you should clean it. If you rear up and fix your cavy with the hand in the neck like birds of prey would do – and some times you have to to fix your cavy like this – you generate a lot of stress for your cavy. Never underestimate the obstinacy of your cavy! If it is in panic and relieve of your hand it will typically fall from the table into its death. So bath it on the floor and sit down beside. Never use aggressive shampoos, anti Anti-Dandruff shampoos or perfumed shampoos as well. Only use special sensitive shampoos typically used for babies. You’ll find it in every drugstore. If you bath it due to some incrustation or agglutination you may renounce every shampoo and only use lukewarm water. If your cavy needs a bath because of parasitic infection: Read the package insert of your product careful and use it as described. Whenever possible fix your cavy at the bottom with your hand and clean it with your other hand and may be a soft flannel. You have to prevent that the cavy submerse so only fill a few cm of water in your tub. The water should be lukewarm only. You reduce stress a lot if you put the forefeet of your Guinea Pig on the border of your can. If you do so, you could fix it quite better also. Never lay a Guinea Pig on its back! Never fill in water higher than your cavies belly! Never put your cavy under running water / shower! Aftercare is very important to prevent some serious problems. 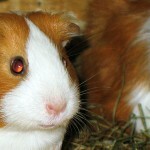 Your cavy must not catch a cold – but this happens very quickly. You have to dry off your cavy quickly and softly with some other dry flannels – and only smooth in fur direction. At last it is also important to use your hair dryer to get your pig back hum. Use your drier at large distance. Never use your drier in cool air function and hold your hand over your cavies head to protect its eyes and nose (do not press your hand on your cavy). With all of our experience: Are you sure that you don’t misapprehend their body language and are you really sure that they like it? I know this is really bad but if we accidently leave their hutch uncleaned for a while (no longer than a week and a half) but we do clean it out eventually, shall we bathe them because i know they get stressed by uncleanliness. We have never done this or left the cage unclean for more than a week btw. I was just wandering. This website is very useful, thanks! No there is no need for you to bath them in that situation. You should not bath her. You should cut the hair! The long haired cavys are special breeds from humans who thought this might be so very, very cute. 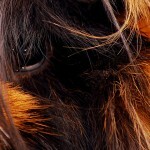 In fact: For the cavy itself it is not – it is a drawback. How often should I bathe my guinea pig? One a month or once a year? I’m wondering since my dog has a schedule of being bathed AT MOST twice a year. As described in the article you should never bath your guinea pig unless you have a serious reason to do this.